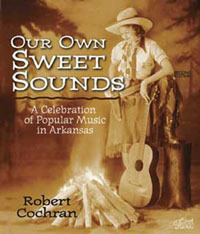 A rich portrait of the community that is Arkansas manifested in song, Our Own Sweet Sounds celebrates the diversity of musical forms and music makers that have graced the state since territorial times. Beginning with the earliest references to Quapaw and Caddo music as first reported by seventeenth-century European explorers and continuing forward to the �bizarrely named grunge bands� who will be stars tomorrow, Robert Cochran traces the music and voices that have enriched the life of the Natural State. Arkansas, many are starting to realize, was caught in a cultural crossfire of music. There were the nearby western swing influence of Tulsa, the blues of Memphis, the Louisiana Hayride of Shreveport, and the influence of Ozark music from Missouri. All of this resulted in the Arkansas cross-culture of blues, country, folk, and rock music, creating a broad spectrum of musical styles and musicians that has left an indelible impression on the Arkansas cultural scene. This new edition includes approximately seventy new artists, some of whom became famous after 1996, when the first edition was published, such as Joe Nichols, and some of whom were left out of the original edition, such as Little Willie John. The valuable �Featured Performers� section�lengthy discussions of individual artists with their photographs�is now one-third larger. This new edition, heavily illustrated, is a loving tribute to the common music that has filled local airwaves, lifted community gatherings to the level of joyous festivities, and enlivened the spirit of music lovers everywhere. Hailed as the state�s leading folklorist by the Arkansas Times, Robert Cochran is professor of English, chair of American Studies, and director of the Center for Arkansas and Regional Studies at the University of Arkansas. Among his many published books are A Photographer of Note: Arkansas Artist Geleve Grice (Arkansas), Vance Randolph: An Ozark Life, and Singing in Zion (Arkansas).